William Ben Hogan (August 13, 1912 – July 25, 1997) was an American professional golfer who is generally considered to be one of the greatest players in the history of the game. He was born within six months of Sam Snead and Byron Nelson, who were two other acknowledged golf greats of the 20th century. Hogan is notable for his profound influence on golf swing theory and his legendary ball-striking ability. His nine career professional major championships tie him with Gary Player for fourth all-time, trailing only Jack Nicklaus (18), Tiger Woods (15) and Walter Hagen (11). He is one of only five golfers to have won all four major championships: the Masters Tournament, The Open (despite only playing once), the U.S. Open, and the PGA Championship. The other four are Nicklaus, Woods, Player, and Gene Sarazen. Hogan was born in Stephenville, Texas, the third and youngest child of Chester and Clara (Williams) Hogan. His father was a blacksmith and the family lived ten miles southwest in Dublin until 1921, when they moved 70 miles (112 km) northeast to Fort Worth. When Hogan was nine years old in 1922, his father Chester committed suicide with a self-inflicted gunshot at the family home. By some accounts, Chester committed suicide in front of him, which some (including Hogan biographer James Dodson) have cited as the cause of his introverted personality in later years. The family incurred financial difficulties after his father's suicide, and the children took jobs to help their seamstress mother make ends meet. Older brother Royal quit school at age 14 to deliver office supplies by bicycle, and nine-year-old Ben sold newspapers after school at the nearby train station. A tip from a friend led him to caddying at the age of 11 at Glen Garden Country Club, a nine-hole course seven miles (11 km) to the south. One of his fellow caddies at Glen Garden was Byron Nelson, later a tour rival. The two would tie for the lead at the annual Christmas caddie tournament in December 1927, when both were 15. Nelson sank a 30-foot putt to tie on the ninth and final hole. Instead of sudden death, they played another nine holes; Nelson sank another substantial putt on the final green to win by a stroke. Hogan dropped out of Central High School during the final semester of his senior year. He turned pro in the golf industry six months shy of his 18th birthday at the Texas Open in San Antonio, in late January 1930. Hogan met Valerie Fox in Sunday school in Fort Worth in the mid-1920s, and they reacquainted in 1932 when he landed a low-paying club pro job in Cleburne, where her family had moved. They married in April 1935 at her parents' home. Hogan's early years as a pro were very difficult; he went broke more than once. He did not win his first tournament until March 1940, when he won three consecutive tournaments in North Carolina. Although it took a decade for Hogan to secure his first victory, his wife Valerie believed in him, and this helped see him through the tough years when he battled a hook that he later cured. During Hogan's prime years of 1938 through 1959, he won 63 professional golf tournaments despite the interruption of his career by World War II and a near-fatal car accident. Hogan served in the U.S. Army Air Forces from March 1943 to June 1945; he was stationed at Fort Worth, Texas, and became a utility pilot with the rank of lieutenant. Hogan and his wife Valerie survived a head-on collision with a Greyhound bus on a fog-shrouded bridge, early in the morning, east of Van Horn, Texas on February 2, 1949. Hogan threw himself across Valerie in order to protect her. He would have been killed had he not done so, because the steering column punctured the driver's seat. This accident left Hogan, age 36, with a double-fracture of the pelvis, a fractured collar bone, a left ankle fracture, a chipped rib, and near-fatal blood clots: he would suffer lifelong circulation problems and other physical limitations. His doctors said he might never walk again, let alone play golf competitively. While Hogan was in the hospital, his life was endangered by a blood clot problem that led doctors to tie off the vena cava. Hogan left the hospital on April 1, 59 days after the accident. Hogan regained his strength by extensive walking and resumed his golf activities in November 1949. He returned to the PGA Tour to start the 1950 season at the Los Angeles Open, where he tied with Sam Snead over 72 holes, but lost the 18-hole playoff. Hogan often declined to play in the PGA Championship; he skipped it more and more often as his career wore on. There were two reasons for this. First, the PGA Championship was, until 1958, a match play event, and Hogan's particular skill was "shooting a number"—meticulously planning and executing a strategy to achieve a score for a round on a particular course (even to the point of leaving out the 7-iron in the U.S. Open at Merion, saying "there are no 7-iron shots at Merion"). Second, the PGA required several days of 36 holes per day competition, and after his 1949 auto accident, Hogan struggled to manage more than 18 holes a day. Ben Hogan is widely acknowledged to be one of the greatest ball strikers who ever played golf. Although he had a formidable record with 64 PGA tour victories, it is Hogan's ball-striking ability that mostly underpins his modern reputation. Hogan was known to practice more than any of his contemporary golfers and is said to have "invented practice". On this matter, Hogan himself said, "You hear stories about me beating my brains out practicing, but... I was enjoying myself. I couldn't wait to get up in the morning, so I could hit balls. When I'm hitting the ball where I want, hard and crisply, it's a joy that very few people experience." 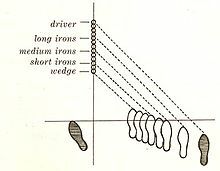 He was also one of the first players to match particular clubs to yardages, or reference points around the course such as bunkers or trees, in order to improve his distance control. The young Hogan was badly afflicted by hooking the golf ball. Although slight of build at 5'8½" and 145 pounds – attributes that earned him the nickname "Bantam", which he thoroughly disliked – he was long off the tee early in his career. Like many professional golfers of his day, he competed in long drive contests as well as matchplay and strokeplay events. Hogan played and practiced golf with only bare hands, i.e., he played or practiced without wearing gloves. Moe Norman did the same, playing and practicing without gloves. The two were arguably the greatest ball strikers golf has ever known; even Tiger Woods quoted them as the only players ever to have "owned their swings", in that they had total control of it and, as a result, the ball's flight. Hogan is thought to have developed a "secret" that made his swing nearly automatic. There are many theories as to its exact nature. The earliest theory is that the "secret" was a special wrist movement known as "cupping under". This information was revealed in a 1955 Life magazine article. However, many believed Hogan did not reveal all that he knew at the time. 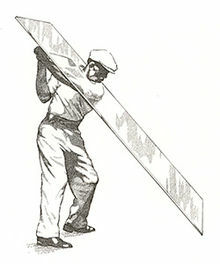 It has since been alleged in Golf Digest magazine, and by Jody Vasquez in his book "Afternoons With Mr Hogan", that the second element of Hogan's "secret" was the way in which he used his right knee to initiate the swing and that this right knee movement was critical to the correct operation of the wrist. Hogan revealed later in life that the "secret" involved cupping the left wrist at the top of the backswing and using a weaker left-hand grip (thumb more on top of the grip as opposed to on the right side). By most accounts, Ben Hogan was the best golfer of his era and still stands as one of the greatest of all time. "The Hawk" possessed fierce determination and an iron will, which combined with his unquestionable golf skills, formed an aura which could intimidate opponents into competitive submission. In Scotland, Hogan was known as "The Wee Ice Man", or, in some versions, "Wee Ice Mon," a moniker earned during his famous British Open victory at Carnoustie in 1953. It is a reference to his steely and seemingly nerveless demeanor, itself a product of a golf swing he had built that was designed to perform better the more pressure he put it under. Hogan rarely spoke during competition, and there are numerous anecdotes about Hogan's sparse but pithy remarks. Hogan was also highly respected by fellow competitors for his superb course management skills. During his peak years, he rarely if ever attempted a shot in competition which he had not thoroughly honed in practice. Although his ball striking was perhaps the greatest ever, Hogan's putting skills are thought to have been below average, though he was capable of putting very well. Solid and sometimes spectacular in his early and peak years, Hogan by his later years deteriorated to the point of being an often poor putter by professional standards, particularly on slow greens. The majority of his putting problems developed after his 1949 car accident, which nearly blinded his left eye and impaired his depth perception. Toward the end of his career, he often stood over the ball inordinately long before drawing his putter back. Ben Hogan won ten tournaments in 1948 alone, including the U.S. Open at Riviera Country Club, a course known as "Hogan's Alley" because of his success there. His 8-under par score in 1948 set a U.S. Open record that was matched only by Jack Nicklaus in 1980, Hale Irwin in 1990, and Lee Janzen in 1993. It was not broken until Tiger Woods shot 12-under par in 2000 (Jim Furyk also shot 8-under par in the 2003, Rory McIlroy set the current record with 16-under par in 2011, which was matched by Brooks Koepka in 2017). Colonial Country Club in Fort Worth, a modern PGA Tour tournament venue, is also known as "Hogan's Alley" and may have the better claim to the nickname as he won its tour event five times. It was his home course after his retirement, and he was an active member of Colonial as well for many years. The sixth hole at Carnoustie, a par five on which Hogan took a famously difficult line off the tee during each of his rounds in the 1953 Open Championship, has also recently been renamed Hogan's Alley. Prior to the 1949 accident, Hogan never truly captured the hearts of his galleries, despite being one of the best golfers of his time. Perhaps this was due to his perceived cold and aloof on-course persona. But when Hogan shocked and amazed the golf world by returning to tournament golf only eleven months after his accident, and took second place in the 1950 Los Angeles Open after a playoff loss to Sam Snead, he was cheered on by ecstatic fans. "His legs simply were not strong enough to carry his heart any longer," famed sportswriter Grantland Rice said of Hogan's near-miss. However, he proved to his critics (and to himself, especially) that he could still win by completing his famous comeback five months later, defeating Lloyd Mangrum and George Fazio in an 18-hole playoff at Merion near Philadelphia to win his second U.S. Open title. Hogan went on to achieve what is perhaps the greatest sporting accomplishment in history, limping to twelve more PGA Tour wins (including six majors) before retiring. In 1951, Hogan entered just five events, but won three of them - the Masters, U.S. Open, and World Championship of Golf, and finished second and fourth in his other two starts. He finished fourth on that season's money list, barely $6,000 behind the season's official money list leader Lloyd Mangrum, who played over twenty events. That year also saw the release of a biopic starring Glenn Ford as Hogan, called Follow the Sun: The Ben Hogan Story. 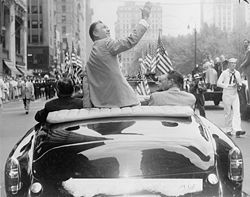 He even received a ticker-tape parade in New York City in 1953, upon his return from winning the British Open, the only time he played the event. With that victory, Hogan became just the second player, after Gene Sarazen, to win all four of the modern major championships—the Masters, U.S. Open, British Open, and PGA Championship. Hogan remains the only player to win the Masters, U.S. Open, and British Open in the same calendar year (1953). His 14-under par at the 1953 Masters set a record that stood for a dozen years; as of 2018, he remains one of just twelve (Jack Nicklaus, Raymond Floyd, Ben Crenshaw, Tiger Woods, David Duval, Phil Mickelson, Charl Schwartzel, Jordan Spieth, Justin Rose, Rickie Fowler, and Patrick Reed) to have recorded such a low score in the tournament. In 1967, at age 54, Hogan shot a record 30 on the back nine at the Masters; the record stood until 1992. Many supporters of Hogan and some golf historians feel that his victory at the Hale America Open in 1942 should be counted as his fifth U.S. Open and 10th major championship, since the tournament was to be a substitute for the Open after its cancellation by the USGA. The Hale America Open was held in the same time slot and was run like the U.S. Open with more than 1,500 entries, local qualifying at 69 sites and sectional qualifying at most major cities. The top players, who were not away fighting in World War II, participated and the largest purse of the year was awarded. Hogan won the Vardon Trophy for lowest scoring average three times: 1940, 1941, and 1948. In 1953, Hogan won the Hickok Belt as the top professional athlete of the year in the United States. The Ben Hogan Award is given annually by the Golf Writers Association of America to a golfer who has stayed active in golf despite a physical handicap or serious illness. The first winner was Babe Zaharias. The Ben Hogan Award is given by Friends of Golf and the Golf Coaches Association of America to the best college golf player since 1990. He was inducted into the World Golf Hall of Fame in 1974. In 1976, Ben Hogan was voted the Bob Jones Award, the highest honor given by the United States Golf Association in recognition of distinguished sportsmanship in golf. A special room is dedicated to Hogan's career, comeback, and accomplishments at the United States Golf Association Museum and Arnold Palmer Center for Golf History in Far Hills, New Jersey. Hogan ranked 38th in ESPN's SportsCentury 50 Greatest Athletes of the 20th Century in 1999. In 2000, Hogan was ranked as the second greatest player of all time by Golf Digest magazine. Jack Nicklaus was first, and Sam Snead was third. In 2009, Hogan was ranked as the fourth greatest player of all time by Golf Magazine. Jack Nicklaus was first, Tiger Woods was second, and Bobby Jones was third. Hogan helped to design the original plans for the Trophy Club Country Club Golfcourse in Trophy Club, Texas, and 9 of the course's 18 holes are designated as the "Hogan" Course. Following his most successful season, Hogan started his golf club company in the fall of 1953 in Fort Worth. Production began in the summer of 1954, with clubs targeted toward "the better player." Always a perfectionist, Hogan is said to have ordered the entire first production run of clubs destroyed because they did not meet his exacting standards. In 1960, he sold the company to American Machine and Foundry (AMF), but stayed on as chairman of the board for several more years. AMF Ben Hogan golf clubs were sold continuously from 1960 to 1985 when AMF was bought by Minstar who sold The Ben Hogan company in 1988 to Cosmo World, who owned the club manufacturer until 1992, when it was sold to another independent investor, Bill Goodwin. Goodwin moved the company out of Fort Worth, and a union shop, to Virginia so it would be close to his home of operations for other AMF brands and, incidentally, a non-union shop in an effort to return the company to profitability. Goodwin sold to Spalding in 1997, closing the sale in January 1998. Spalding returned manufacturing to Hogan's Fort Worth, Texas roots before eventually including the company's assets in a bankruptcy sale of Spalding's Topflite division to Callaway in 2004. Callaway now owns the rights to the Ben Hogan brand. After over a half century and numerous ownership changes, the Ben Hogan line was discontinued by Callaway in 2008. In May 2014, Terry Koehler of Eldolon Brands approached Perry Ellis International and got the rights to use Ben Hogan's name for a line of golf clubs. 2017 - Ben Hogan Golf Equipment Company reemerges as golf's first & only direct-to-consumer only golf equipment company. Hogan died in Fort Worth, Texas on July 25, 1997 at the age of 84, and is interred at Greenwood Memorial Park there. 1 Defeated Mangrum and Fazio in 18-hole playoff: Hogan 69 (−1), Mangrum 73 (+3), Fazio 75 (+5). ^ "The Hard Life of a Golfing Great". Bloomberg Businessweek. June 18, 2004. Archived from the original on March 8, 2012. Retrieved October 17, 2013. ^ "Ben Hogan's Triple Crown". The Augusta Chronicle. February 15, 2013. Retrieved April 27, 2015. ^ Elliott, Len; Kelly, Barbara (1976). Who's Who in Golf. New Rochelle, New York: Arlington House. pp. 93–4. ISBN 0-87000-225-2. ^ Jacobs, John (2000). Fifty Greatest Golf Lessons of the Century. William Morrow. ISBN 978-0062716149. ^ Middlecoff, Cary (1974). Michael, Tom (ed.). The Golf Swing. Prentice-Hall. p. 32. ASIN B000N6ZBEQ. ^ Politi, Steve. "Ben Hogan made U.S. Open history with the 1 iron, but the club has vanished from golf". New Jersey On-Line LLC. Retrieved October 29, 2015. ^ Wanke, Michele. "Sports Illustrated Photo Pioneers". LoveToKnow. Retrieved October 29, 2015. ^ a b c d e f g h i j k l m n o p q r s t u v Hogan, Ben (1957). Ben Hogan's Five Lessons. Fireside. ISBN 0-671-61297-2. ^ Hogan, Ben (March 11, 1957). "The modern fundamentals of golf: the grip". Sports Illustrated: 8. ^ "1953 Ben Hogan". The Open. Archived from the original on October 16, 2013. Retrieved October 17, 2013. ^ Wagner, James (March 13, 2009). "Are the yips more than something in the head?". Los Angeles Times. Archived from the original on March 17, 2009. ^ Kelly, Brent. "PGA Tour Scoring Record – Most Strokes Under Par Over 72 Holes". About.com. Retrieved January 27, 2013. ^ McAfee, James (June 6, 2011). "Did Ben Hogan Win Five U.S. Opens?". Exegolf magazine. Archived from the original on July 31, 2012. Retrieved September 16, 2011. ^ Hanley, Reid (June 16, 1992). "Hale America: A U.S. Open?". Chicago Tribune. Retrieved September 16, 2011. ^ Alvarez, Rob (June 23, 2011). "Museum Moment: The Hale America National Open Golf Tournament". USGA Museum. Retrieved September 16, 2011. ^ Golf Magazine, September 2009. ^ Wall, Jonathan (May 20, 2014). "Return of a legendary brand". PGA Tour. ^ Rovell, Darren (August 12, 2003). "Legendary brand will soon have new owner - again". ESPN. Retrieved May 26, 2010. Barkow, Al (1989). The History of the PGA TOUR. Doubleday. ISBN 0-385-26145-4. "Ben Hogan: "Players Were Afraid"" (1999). In ESPN SportsCentury. Michael MacCambridge, Editor. New York: Hyperion ESPN Books. pp. 142–3. Dodson, James (2004). Ben Hogan: An American Life. New York: Doubleday. ISBN 0-385-50312-1. McLean, Jim; McCarthy, Tom (2012). The Complete Hogan. New Jersey: John Wiley & Sons. ISBN 978-0-470-87624-4.